Horton Hears a Sterile Neutrino? So far, the hunt for sterile neutrinos has come up empty. 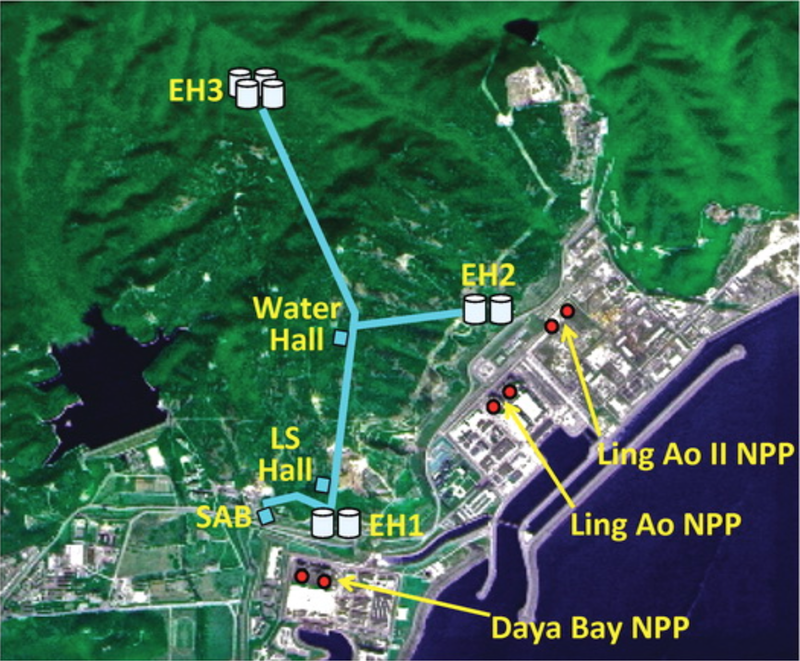 Could a joint analysis between MINOS, Daya Bay and Bugey-3 data hint at their existence? Neutrinos, like the beloved Whos in Dr. Seuss’ “Horton Hears a Who!,” are light and elusive, yet have a large impact on the universe we live in. While neutrinos only interact with matter through the weak nuclear force and gravity, they played a critical role in the formation of the early universe. Neutrino physics is now an exciting line of research pursued by the Hortons of particle physics, cosmology, and astrophysics alike. 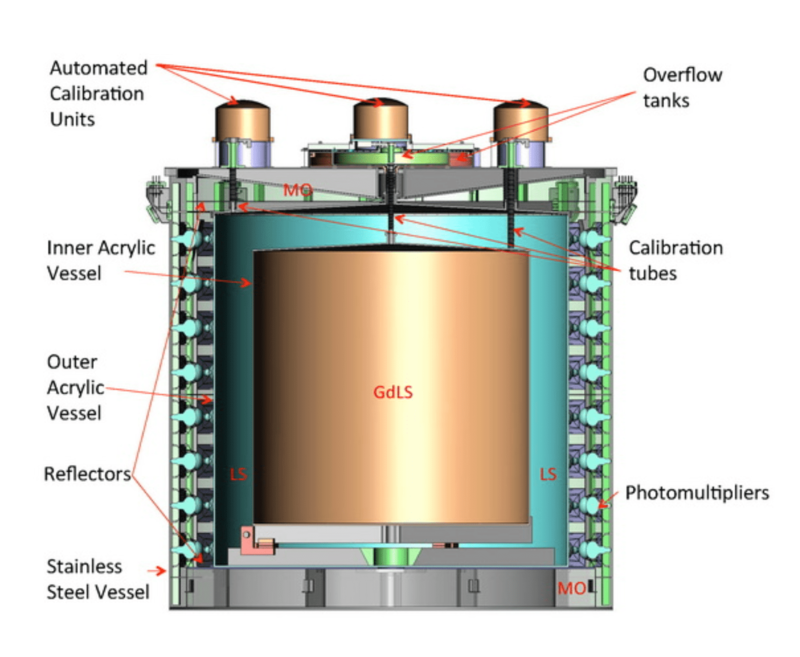 While most of what we currently know about neutrinos is well described by a three-flavor neutrino model, a few inconsistent experimental results such as those from the Liquid Scintillator Neutrino Detector (LSND) and the Mini Booster Neutrino Experiment (MiniBooNE) hint at the presence of a new kind of neutrino that only interacts with matter through gravity. If this “sterile” kind of neutrino does in fact exist, it might also have played an important role in the evolution of our universe. The three known neutrinos come in three flavors: electron, muon, or tau. The discovery of neutrino oscillation by the Sudbury Neutrino Observatory and the Super-Kamiokande Observatory, which won the 2015 Nobel Prize, proved that one flavor of neutrino can transform into another. This led to the realization that each neutrino mass state is a superposition of the three different neutrino flavor states. From neutrino oscillation measurements, most of the parameters that define the mixing between neutrino states are well known for the three standard neutrinos. The relationship between the three known neutrino flavor states and mass states is usually expressed as a 3×3 matrix known as the PMNS matrix, for Bruno Pontecorvo, Ziro Maki, Masami Nakagawa and Shoichi Sakata. The PMNS matrix includes three mixing angles, the values of which determine “how much” of each neutrino flavor state is in each mass state. The distance required for one neutrino flavor to become another, the neutrino oscillation wavelength, is determined by the difference between the squared masses of the two mass states. The values of mass splittings and are known to good precision. A “sterile” neutrino is referred to as such because it would not interact weakly: it would only interact through the gravitational force. Neutrino oscillations involving the hypothetical sterile neutrino can be understood using a “four-flavor model,” which introduces a fourth neutrino mass state, , heavier than the three known “active” mass states. This fourth neutrino state would be mostly sterile, with only a small contribution from a mixture of the three known neutrino flavors. If the sterile neutrino exists, it should be possible to experimentally observe neutrino oscillations with a wavelength set by the difference between and the square of the mass of another known neutrino mass state. Current observations suggest a squared mass difference in the range of 0.1-10 eV . Oscillations between active and sterile states would result in the disappearance of muon (anti)neutrinos and electron (anti)neutrinos. In a disappearance experiment, you know how many neutrinos of a specific type you produce, and you count the number of that type of neutrino a distance away, and find that some of the neutrinos have “disappeared,” or in other words, oscillated into a different type of neutrino that you are not detecting. MINOS and Daya Bay/Bugey-3 combined 90% confidence level limits (in red) compared to the LSND and MiniBooNE 90% confidence level allowed regions (in green/purple). Plots the mass splitting between mass states 1 and 4 (corresponding to the sterile neutrino) against a function of the mixing angle, which is equivalent to a function involving the 1-4 and 2-4 mixing angles. Regions of parameter space to the right of the red contour are excluded, counting out the majority of the LSND/MiniBooNE allowed regions. Source: arXiv:1607.01177v4. 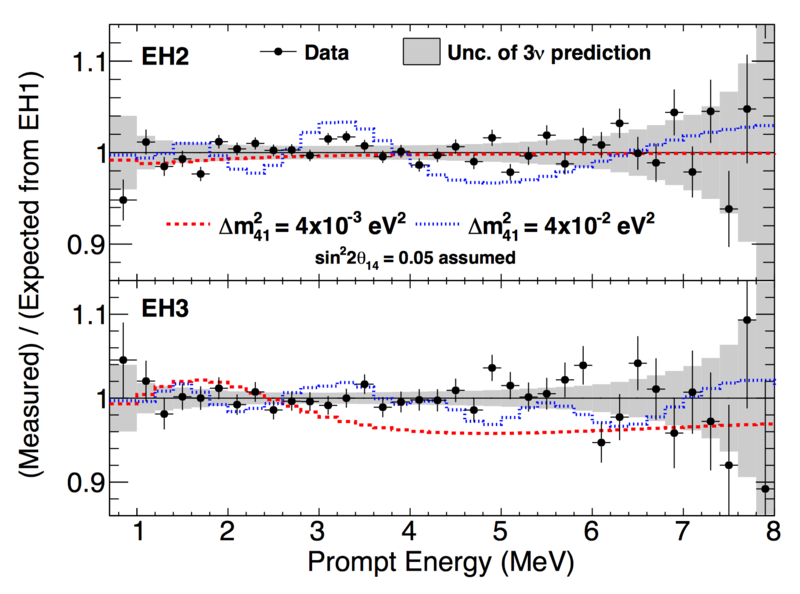 Assuming a four-flavor model, the MINOS and Daya Bay collaborations put new constraints on the value of the mixing angle , the parameter controlling electron (anti)neutrino appearance in experiments with short neutrino travel distances. As for the hypothetical sterile neutrino? The analysis excluded the parameter space allowed by the LSND and MiniBooNE appearance-based indications for the existence of light sterile neutrinos for < 0.8 eV at a 95% confidence level. 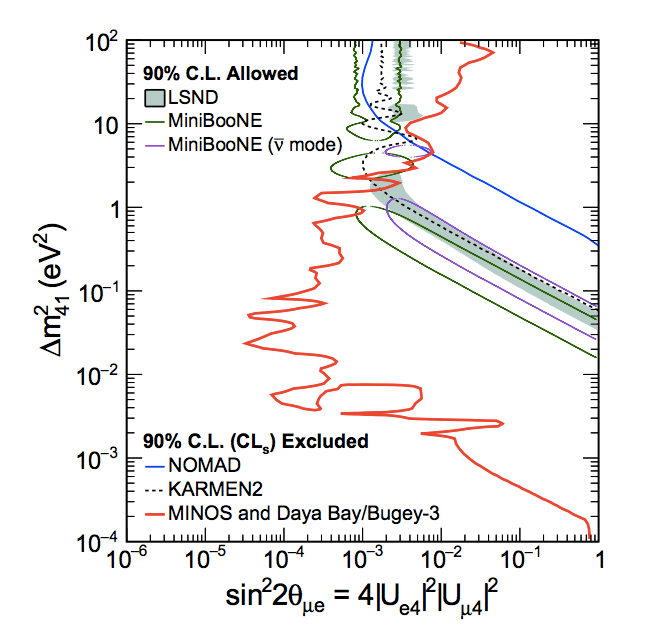 In other words, the MINOS and Daya Bay analysis essentially rules out the LSND and MiniBooNE inconsistencies that allowed for the presence of a sterile neutrino in the first place. These results illustrate just how at odds disappearance searches and appearance searches are when it comes to providing insight into the existence of light sterile neutrinos. If the Whos exist, they will need to be a little louder in order for the world to hear them. 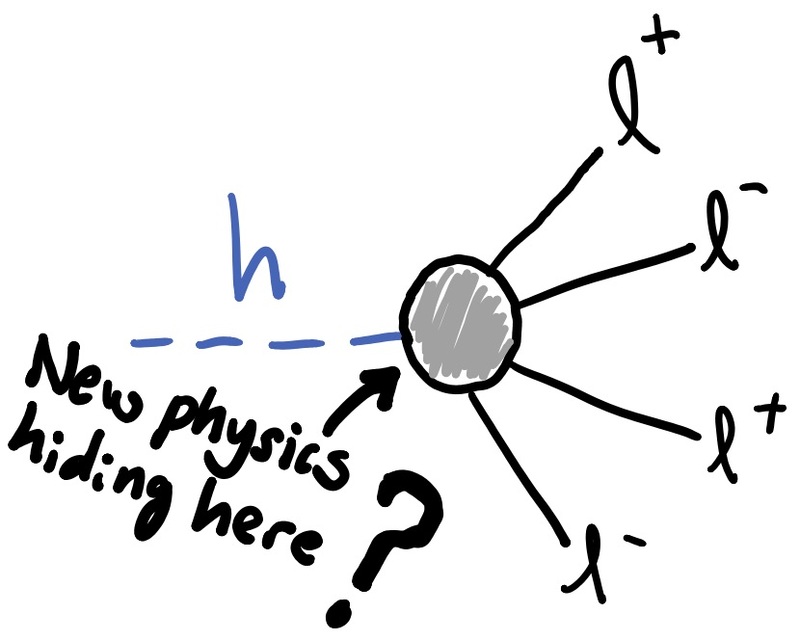 Previously I discussed how one of the best and most precise ways to study the Higgs boson is just by `shining light on it’, or more specifically via its decays to pairs of photons. 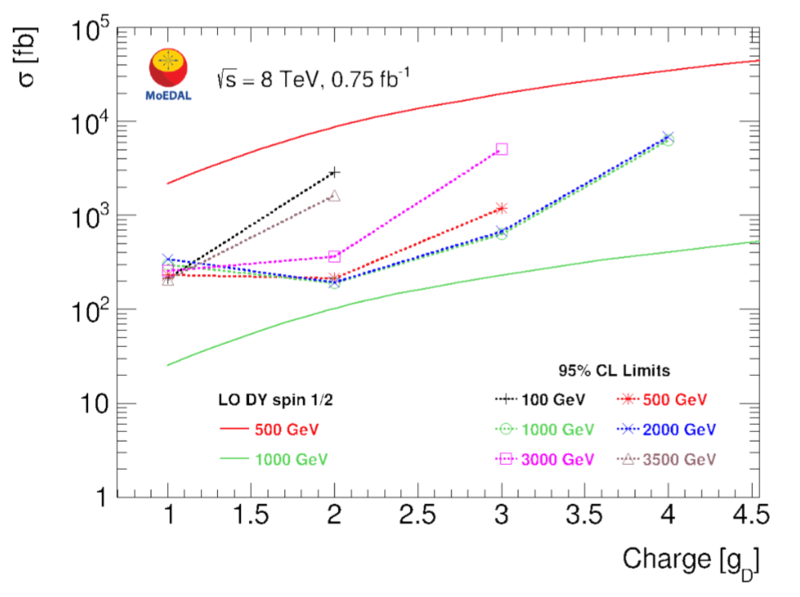 Today I want to expand on another fantastic and precise way to study the Higgs which I briefly mentioned previously; Higgs decays to four charged leptons (specifically electrons and muons) shown in Fig.2. This is a channel near and dear to my heart and has a long history because it was realized, way before the Higgs was actually discovered at 125 GeV, to be among the best ways to find a Higgs boson over a large range of potential masses above around 100 GeV. This led to it being dubbed the “gold plated” Higgs discovery mode, or “golden channel”, and in fact was one of the first channels (along with the diphoton channel) in which the 125 GeV Higgs boson was discovered at the LHC. Figure 2: Higgs decays to four leptons are mediated by the various physics effects which can enter in the grey blob. Could new physics be hiding in there? 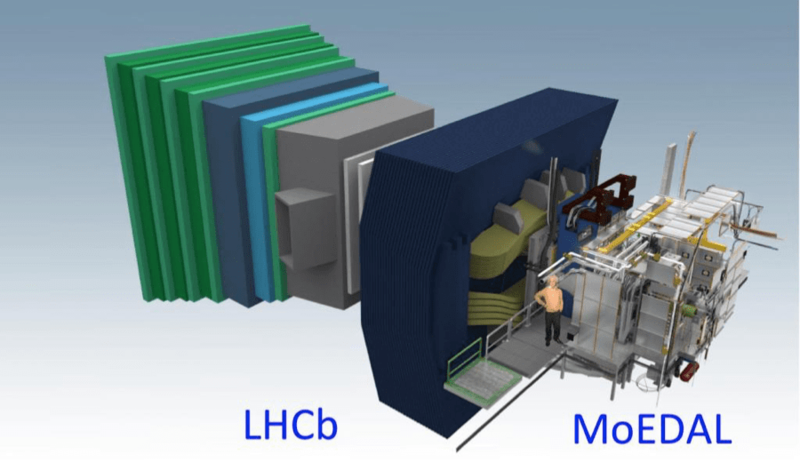 One of the characteristics that makes the golden channel so valuable as a probe of the Higgs is that it is very precisely measured by the ATLAS and CMS experiments and has a very good signal to background ratio. Furthermore, it is very well understood theoretically since most of the dominant contributions can be calculated explicitly for both the signal and background. The final feature of the golden channel that makes it valuable, and the one that I will focus on today, is that it contains a wealth of information in each event due to the large number of observables associated with the four final state leptons. Since there are four charged leptons which are measured and each has an associated four momentum, there are in principle 16 separate numbers which can be measured in each event. However, the masses of the charged leptons are tiny in comparison to the Higgs mass so we can consider them as massless (see Footnote 1) to a very good approximation. This then reduces (using energy-momentum conservation) the number of observables to 12 which, in the lab frame, are given by the transverse momentum, rapidity, and azimuthal angle of each lepton. Now, Lorentz invariance tells us that physics doesnt care which frame of reference we pick to analyze the four lepton system. This allows us to perform a Lorentz transformation from the lab frame where the leptons are measured, but where the underlying physics can be obscured, to the much more convenient and intuitive center of mass frame of the four lepton system. Due to energy-momentum conservation, this is also the center of mass frame of the Higgs boson. In this frame the Higgs boson is at rest and the of leptons come out back to back (see Footnote 2) . In this frame the 12 observables can be divided into 4 production and 8 decay (see Footnote 3). The 4 production variables are characterized by the transverse momentum (which has two components), the rapidity, and the azimuthal angle of the four lepton system. 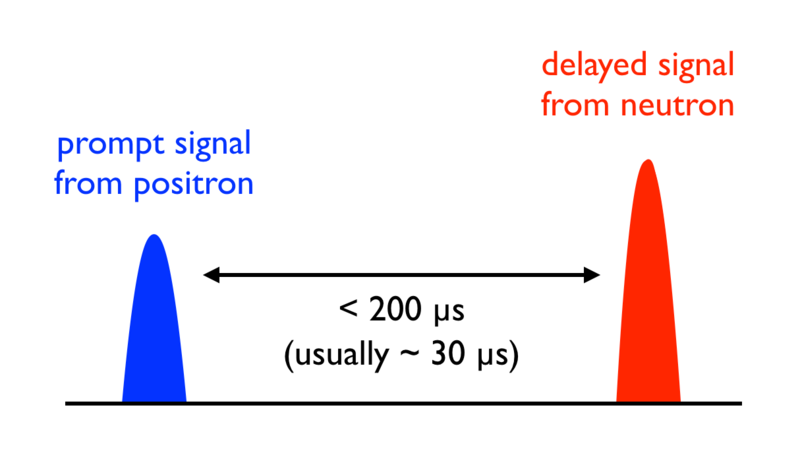 The differential spectra for these four variables (especially the transverse momentum and rapidity) depend very much on how the Higgs is produced and are also affected by parton distribution functions at hadron colliders like the LHC. Thus the differential spectra for these variables can not in general be computed explicitly for Higgs production at the LHC. 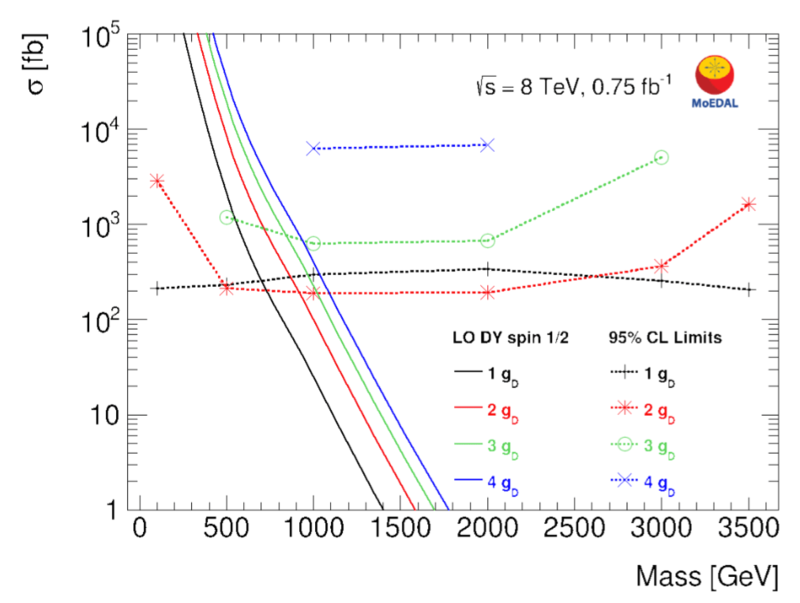 The 8 decay observables are characterized by the center of mass energy of the four lepton system, which in this case is equal to the Higgs mass, as well as two invariant masses associated with each pair of leptons (how one picks the pairs is arbitrary). There are also five angles ( , Φ, Φ1) shown in Fig. 3 for a particular choice of lepton pairings. The angle is defined as the angle between the beam axis (labeled by p or z) and the axis defined to be in the direction of the momentum of one of the lepton pair systems (labeled by Z1 or z’). This angle also defines the ‘production plane’. The angles are the polar angles defined in the lepton pair rest frames. The angle Φ1 is the azimuthal angle between the production plane and the plane formed from the four vectors of one of the lepton pairs (in this case the muon pair). Finally Φ is defined as the azimuthal angle between the decay planes formed out of the two lepton pairs. 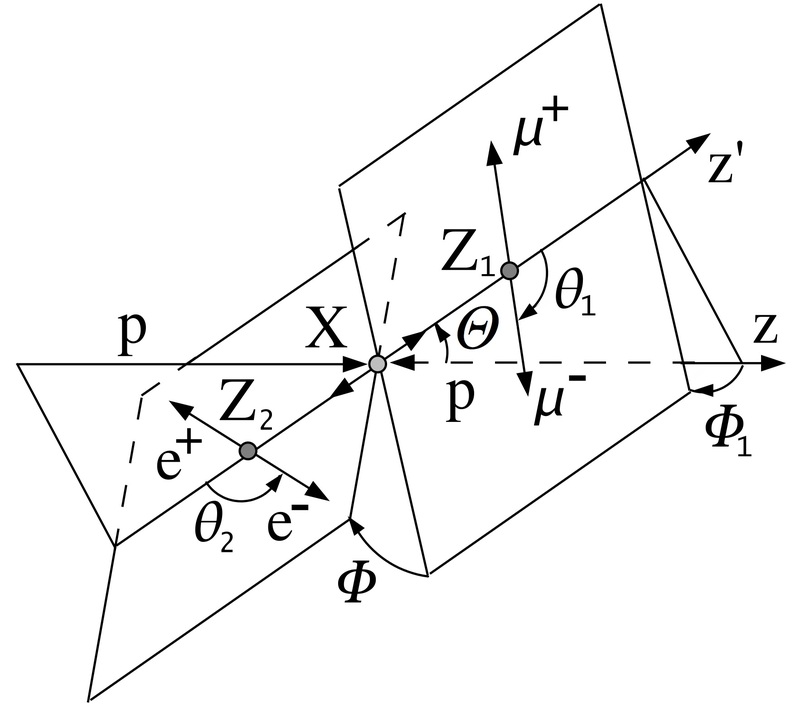 Figure 3: Angular center of mass observables in Higgs to four lepton decays. 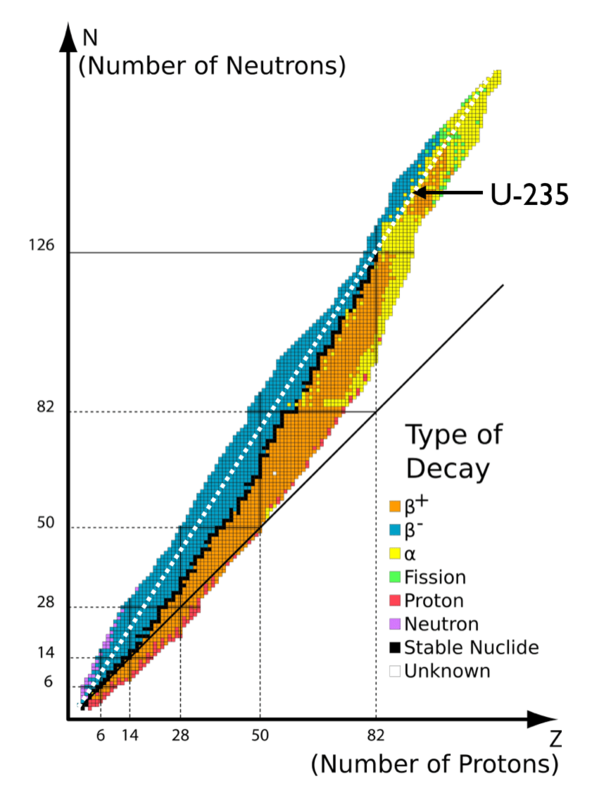 To a good approximation these decay observables are independent of how the Higgs boson is produced. Furthermore, unlike the production variables, the fully differential spectra for the decay observables can be computed explicitly and even analytically. Each of them contains information about the properties of the Higgs boson as do the correlations between them. We see an example of this in Fig. 4 where we show the one dimensional (1D) spectrum for the Φ variable under various assumptions about the CP properties of the Higgs boson. Figure 4: Here I show various examples for the Φ differential spectrum assuming different possibilities for the CP properties of the Higgs boson. This variable has long been known to be sensitive to the CP properties of the Higgs boson. An effect like CP violation would show up as an asymmetry in this Φ distribution which we can see in curve number 5 shown in orange. Keep in mind though that although I show a 1D spectrum for Φ, the Higgs to four lepton decay is a multidimensional differential spectrum of the 8 decay observables and all of their correlations. Thus though we can already see from a 1D projection for Φ how information about the Higgs is contained in these distributions, MUCH more information is contained in the fully differential decay width of Higgs to four lepton decays. This makes the golden channel a powerful probe of the detailed properties of the Higgs boson. OK nibblers, hopefully I have given you a flavor of the golden channel and why it is valuable as a probe of the Higgs boson. In a future post I will discuss in more detail the various types of physics effects which can enter in the grey blob in Fig. 2. Until then, keep nibbling and don’t let dead diphotons get you down! Footnote 1: If you are feeling uneasy about the fact that the Higgs can only “talk to” particles with mass and yet can decay to four massless (atleast approximately) leptons, keep in mind they do not interact directly. The Higgs decay to four charged leptons is mediated by intermediate particles which DO talk to the Higgs and charged leptons. Footnote 2: More precisely, in the Higgs rest frame, the four vector formed out of the sum of the two four vectors of any pair of leptons which are chosen will be back to back with the four vector formed out of the sum of the second pair of leptons. Footnote 3: This dividing into production and decay variables after transforming to the four lepton system center of mass frame (i.e. Higgs rest frame) is only possible in practice because all four leptons are visible and their four momentum can be reconstructed with very good precision at the LHC. This then allows for the rest frame of the Higgs boson to be reconstructed on an event by event basis. For final states with missing energy or jets which can not be reconstructed with high precision, transforming to the Higgs rest frame is in general not possible. The title of this paper sounds like some standard astrophysics analyses; but, dig a little deeper and you’ll find – what I think – is an incredibly interesting, surprising and unexpected observation. Last year, using the WM Keck Observatory and the Gemini North Telescope in Manuakea, Hawaii, the Dragonfly Telephoto Array observed the Coma cluster (a large cluster of galaxies in the constellation Coma – I’ve included a Hubble Image to the left). 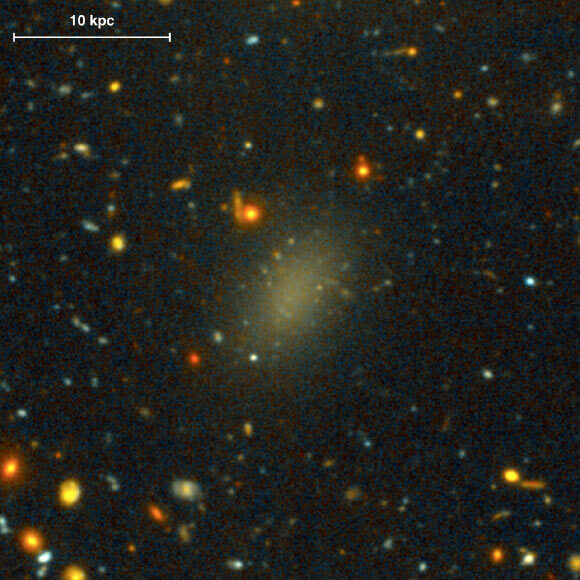 The team identified a population of large, very low surface brightness (ie: not a lot of stars), spheroidal galaxies around an Ultra Diffuse Galaxy (UDG) called Dragonfly 44 (shown below). They determined that Dragonfly 44 has so few stars that gravity could not hold it together – so some other matter had to be involved – namely DARK MATTER (my favorite kind of unknown matter). The team used the DEIMOS instrument installed on Keck II to measure the velocities of stars for 33.5 hours over a period of six nights so they could determine the galaxy’s mass. Observations of Dragonfly 44’s rotational speed suggest that it has a mass of about one trillion solar masses, about the same as the Milky Way. However, the galaxy emits only 1% of the light emitted by the Milky Way. In other words, the Milky Way has more than a hundred times more stars than Dragonfly 44. I’ve also included the Mass-to-Light ratio plot vs. the dynamical mass. This illustrates how unique Dragonfly 44 is compared to other dark matter dominated galaxies like dwarf spheroidal galaxies. 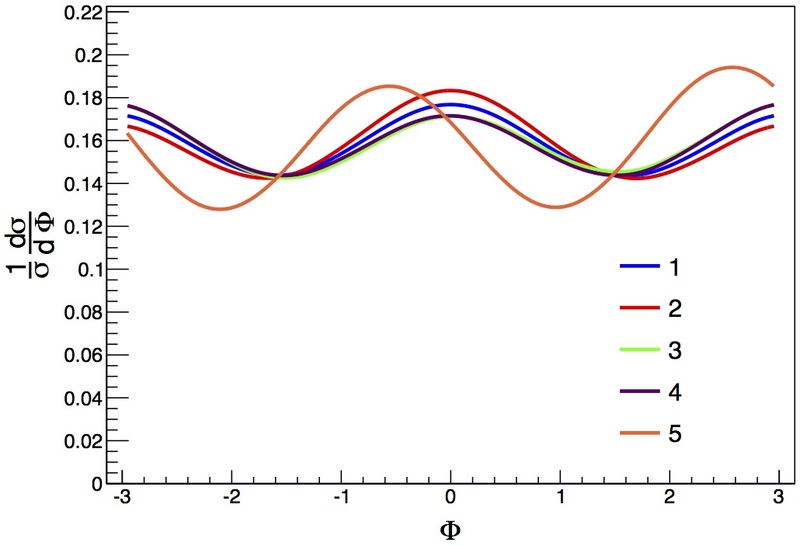 Relation between dynamical mass-to-light ratio and dynamical mass. Open symbols are dispersion-dominated objects from Zaritsky, Gonzalez, & Zabludoff (2006) and Wolf et al. (2010). 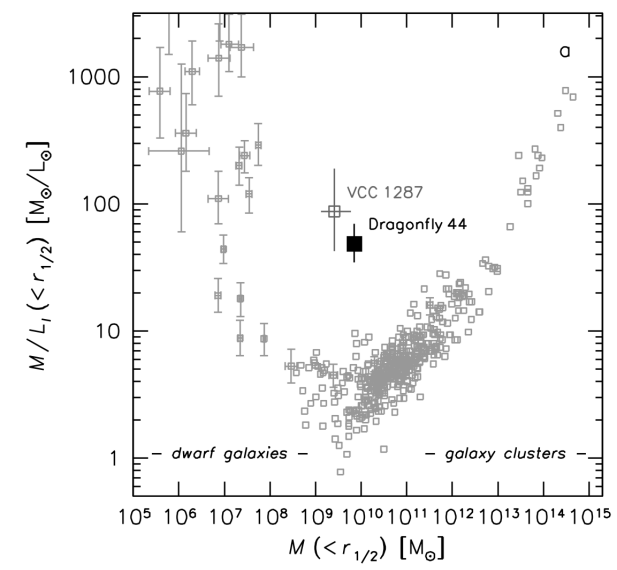 The UDGs VCC 1287 (Beasley et al. 2016) and Dragonfly 44 fall outside of the band defined by the other galaxies, having a very high M/L ratio for their mass. What is particularly exciting is that we don’t understand how galaxies like this form. Their research indicates that these UDGs could be failed galaxies, with the sizes, dark matter content, and globular cluster systems of much more luminous objects. But we’ll need to discover more to fully understand them.